Eight out of 10 physicians have adopted or plan to adopt an electronic health record (EHR), with practice size and financial incentives emerging as significant factors influencing adoption rates. These survey results were issued in a new report from the Office of the National Coordinator for Health Information Technology (ONC). 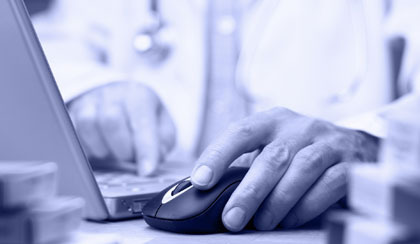 The 2011–2013 Physician Workflow Surveys (supplements to the National Ambulatory Medical Care Survey [NAMCS] from the Centers for Disease Control and Prevention [CDC]) sought to assess the attitudes and experiences with EHRs among a subsample of physicians eligible for the 2011 NAMCS survey. Only physicians that provided direct patient care in office-based practices and community health centers were included in the study. Eight in ten physicians stated that they had adopted or plan to adopt an HER, with 82% of EHR adopters using a meaningful use-enabled HER. High adoption rates were seen among large and multi-practice physicians and lower adoption rates among solo and small practice physicians. Forty-one percent of those who reported that they did not plan to adopt an HER cited retirement as the reason for non-adoption; the largest percentage of those who were either uncertain or did not plan to adopt an EHR were physicians working as solo practitioners or in small practices. Among physicians who adopted EHRs prior to the passage of the Health Information Technology for Economic and Clinical Health (HITECH) Act in 2009, only 23% reported financial incentives as a significant factor in adoption, vs. 62% of those who adopted between 2010–2013. More than one-third of adopters and non-adopters also stated that the ability to electronically exchange patient health information to other providers was, or would be, a major influence regarding adoption. The availability of technical assistance was also noted as a factor for those who adopted post-HITECH; however, the need for technical assistance was listed as a factor in adoption decision-making for 46% of non-adopters and 40% of those who do not plan to adopt listed lack of staffing and time as factors in the lack of technical assistance. Future efforts to narrow the EHR adoption gap overall will involve continuing to focus attention on solo and small practice physicians, particularly regarding financial incentives, the report concludes. For more information visit HealthIT.gov.